Popular Nigerian Instagram celeb, Romangoddess is now a married woman. 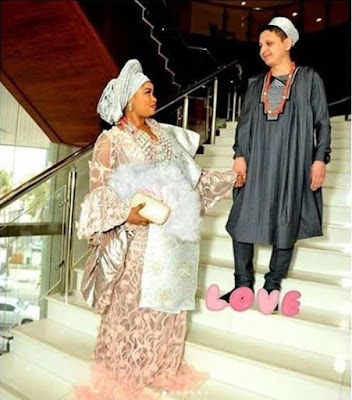 She announced her engagement to a white man in Dubai, United Arab Emirates as they flew out of Lagos State on vacation. The curvaceous lady got married to her Middle-east-based lover, last week. She captioned one of the photos; "Kim n Bay no do pass ds .. don't judge the books by it cover"
Romangoddess before now lived in the Magodo area of Lagos State in opulence as she cruished two posh cars without a known source of income. Rumours have it that her man is wealthy.